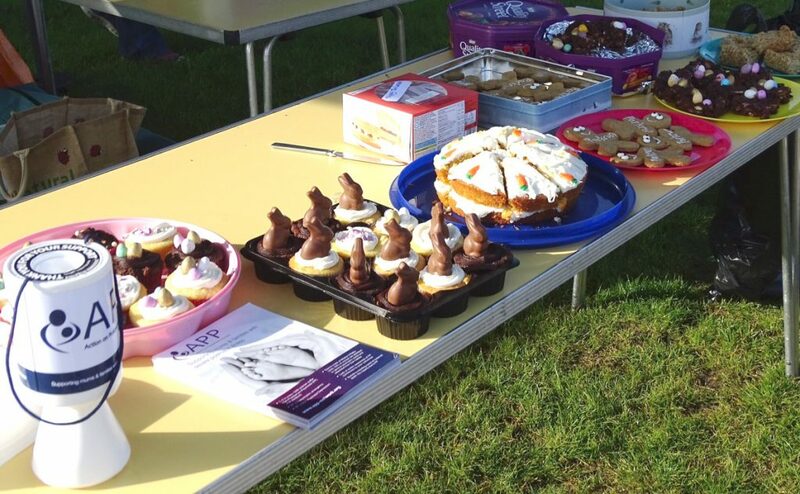 Thank you to Helen who raised over £200 serving up delicious home-baked cakes with tea coffee at the Northallerton Park Run, which took place on Easter Saturday, 20th April. Helen was busy baking up some lovely cakes and buns and the sun shone brightly on the day - it looks fantastic and the runners were definitely well looked after! You can still donate via Helen's JustGiving page here. A huge thank you to Helen for all your amazing baking skills and hard work in support of APP! On the 9th April, Dr Jess Heron, APP Director and Dr Sally Wilson, APP Training Coordinator, presented at the Midlands Maternity and Midwifery Festival at Leicester football club. They spoke to a packed conference hall of midwives, including student midwives about an evaluation of the 1-day workforce training that APP offer. This series of conferences run across the UK and are a great platform for raising awareness of postpartum psychosis amongst midwives and other health professionals, which is one of APP's aims for 2019. 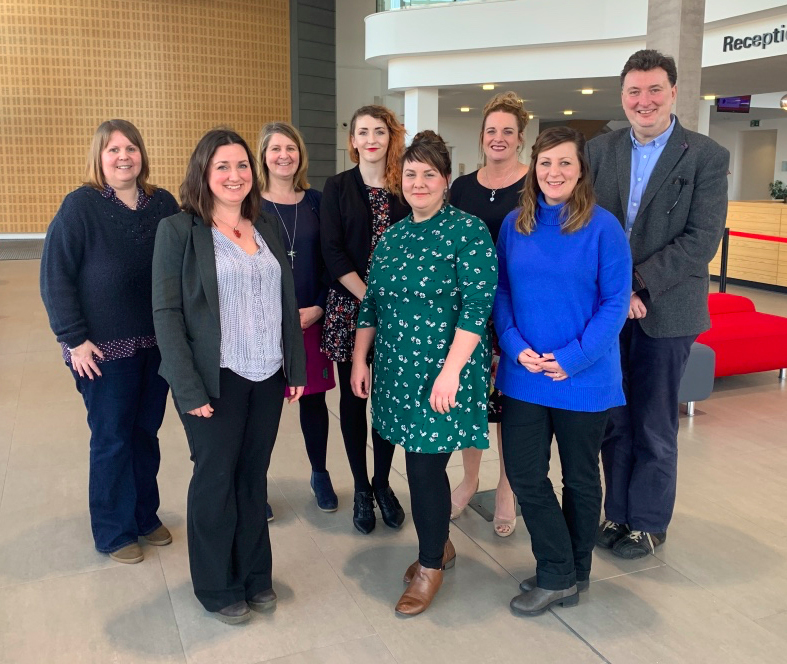 APP want to help health professionals to recognise early signs and symptoms, promote the importance of timely treatment, and talk about recovery and support needs for women and their families affected by postpartum psychosis. We are campaigning this year for compulsory training in perinatal mental health, including Postpartum Psychosis for midwives. Training in Postpartum Psychosis: Evaluation & Lessons - Dr Jessica Heron and Dr Sally Wilson from Narrowcast Media Group on Vimeo. The Nursing & Midwifery Council have recently announced a consultation on the 'Future Midwife: Standards of Proficiency for Midwives'. We are delighted that Postpartum Psychosis has been specifically included as a core learning topic for midwives. We would like to make sure it stays included as these standards are refined and consulted upon. If you have experienced PP and would like to make comments, or are a midwife and would like to state how important it is that Postpartum Psychosis is in core midwife standards. Please respond to the consultation by the 9th May 2019 via here or, please get in touch with Sally if you would like to give any feedback for APP's response. If you have have comments, quotes and stories that you could share with us about your midwifery care, these are really useful in helping to campaign. APP will be responding to make sure postpartum psychosis and training in PP for midwives remains a focus in these standards. A fantastic 'Ladies Charity Night'! A big Thank You to Debbie Walter and Naomi Gibbs who hosted a fantastic Ladies charity event supporting West Berkshire Parent Carer Forum and APP at Deanwood Park, Stockcross on Saturday 30th March 2019. "Let’s raise a glass to the amazing team of helpers, donators, professionals and attendees! 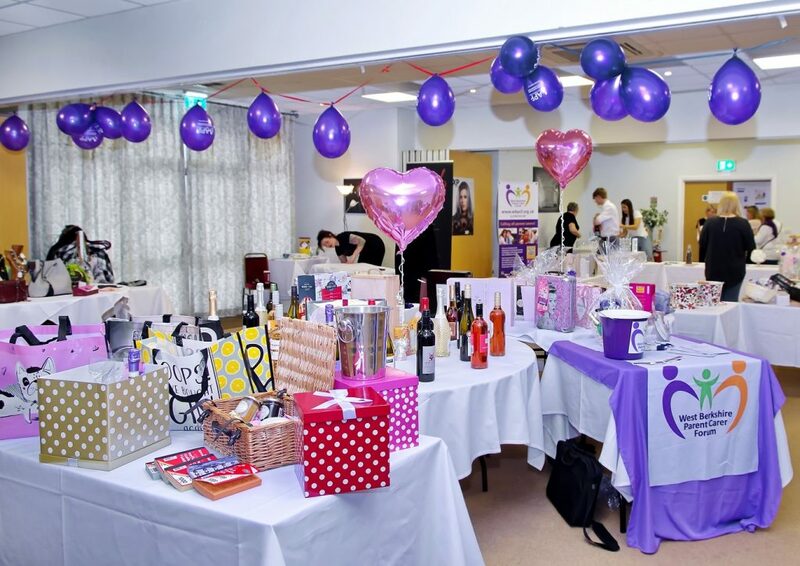 The Ladies charity event was made possible by Deanwood Park in Stockcross generously providing their fabulous function room which was a perfect venue for our ladies. Their staff team Nigel, Flip, Ben and Chris worked tirelessly and went the extra mile to make the event special. Naomi Gibbs, beauty therapist and director of The Hourglass wanted to bring together women to celebrate their natural beauty and raise funds for charities that made a direct difference to families’ lives. Working alongside a lifelong friend and professional mobile hair stylist Debbie at Hair Alchemy they decided to offer an evening of professional hair and beauty, shopping and of course cocktails! Guests were spoilt for choice with two fabulous make-up artists Chloe (Fox and Hounds) and Ella Beauty who enhanced their make-up and offered professional advice. They truly worked their magic. Debbie was then was on hand to tweak their hair and spruce their styles. Ladies were then able to have a professional photo shoot with Dawn Lowe. Fiona Worby was present from West Berkshire Parent Carer Forum, a local special needs charity and the co-host Debbie Walter was representing the charity Action on Postpartum Psychosis, a charity which had personally supported her and her family. Also supporting the event were stall holders Ann-Marie with homemade chocolate gifts, Emil from Vamped demonstrating cosmetic fillers and discussing Botox. Debbie Medlin a special needs massage therapist gave up her time with friend offering sample massage treatments on the night. There was a fabulous pop up clothes shop, manned by Angela Watson and many clothes and gifts were donated by generous clients. Ladies were also able to book a clairvoyant reading with Lorraine Lees who proved very accurate and popular. The night managed to successfully raised £660 which will be split between the charities. A huge thank-you to the generosity of local companies such as: Camp Hopson, Lorraine Lees, The Woodpecker, Crab and Boar, Compton Barbers, UK Paintball, Emma James Photography, Dawn L Lowe Photography, Pilates with Danni, The Hourglass, Hair Alchemy, Massage Therapy with Debbie Medlin, The Fox and Hounds, cakes by Kate, Deanwood Park Golf and Deanwood Park therapies, Kylie Barke and Philippa Ponting." A very big thank you to Debbie and Naomi for organising the event and to everyone who took part and so generously donated gifts as well - we couldn't do this without you! Oórlagh and team take on the Belfast Marathon! A big thank you to Oórlagh and team of friends and family who are taking on the Belfast Marathon and 9 Mile Walk on Sunday 5th May in aid of APP! 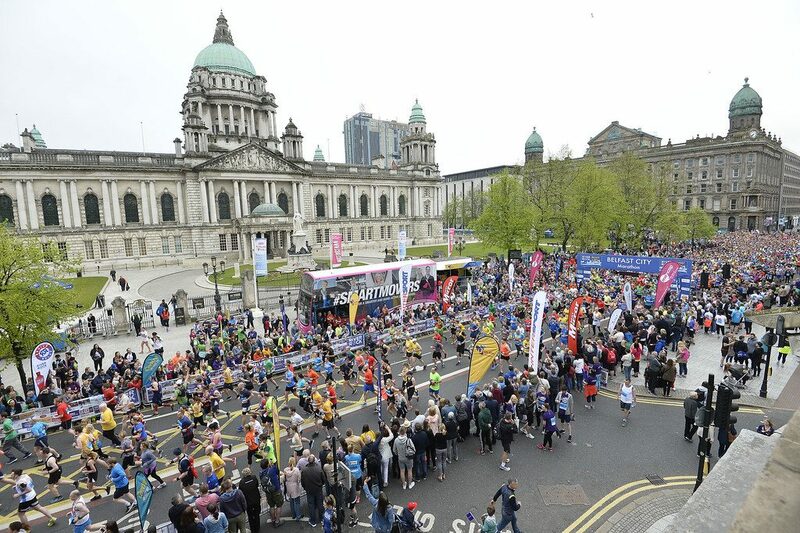 The 2019 Deep RiverRock Belfast City Marathon route begins in Stormont and finishes at Ormeau Park with over 17,000 participants expected to hit the streets of North, South, East and West of the City. Oórlagh says: "All donations will help create much needed awareness and support for such an important charity, APP. Thank you to all those who have already sponsored with cash. Greatly appreciated." Please support Oórlagh and her team and donate what you can via her JustGiving page here. Huge thanks to everyone taking part! An amazing evening of Music 4 Mums! A huge Thank You to everyone involved in the Music 4 Mums event that took place at The Gresham Centre, London, on Friday 29th March. 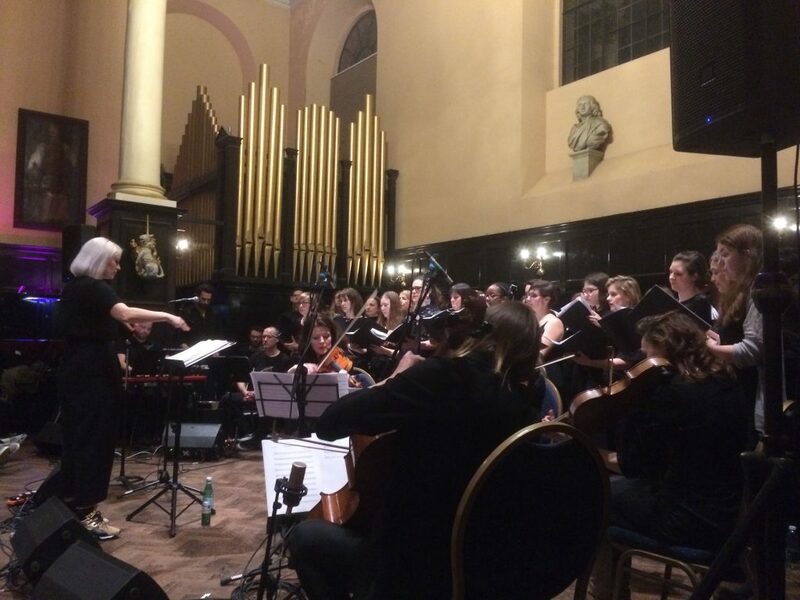 It was a truly fantastic evening, and a very special event to start APP’s Music 4 Mums celebrations for 2019, to mark UK Maternal Mental Health Awareness Week (29 April to 3rd May). "When I was asked to say a few words between numbers sung by the Choir Baby, Kings Place Choir and Great Ormond Street Choir, with their Director Naomi Hammerton, I felt really lucky on so many levels to be there. 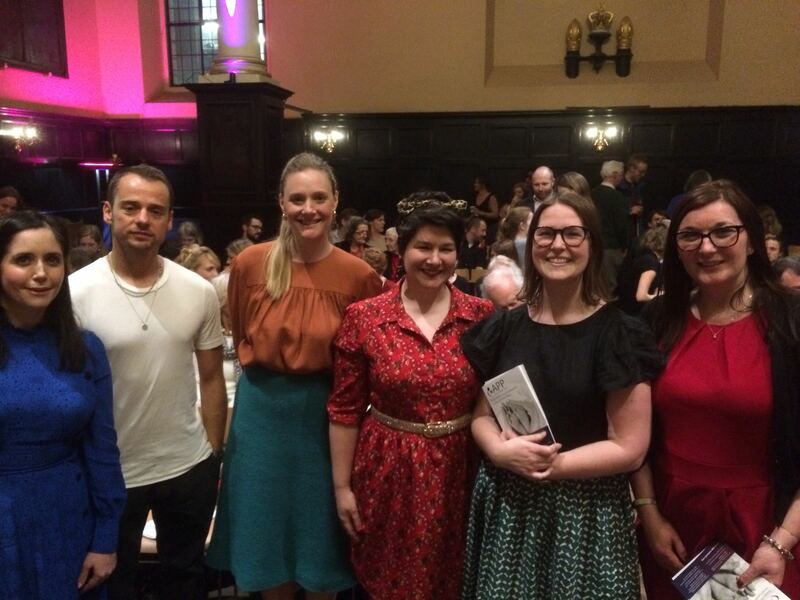 It was a wonderful opportunity to spend time with London Regional APP volunteers, Sophie and Jessie, who were fantastic in helping to represent APP at the packed event held in the beautiful surroundings and acoustics of the Gresham Centre, in the city of London near St Paul’s. We also bumped into APP Media volunteer Fiona and managed to grab a photo with her in the interval! 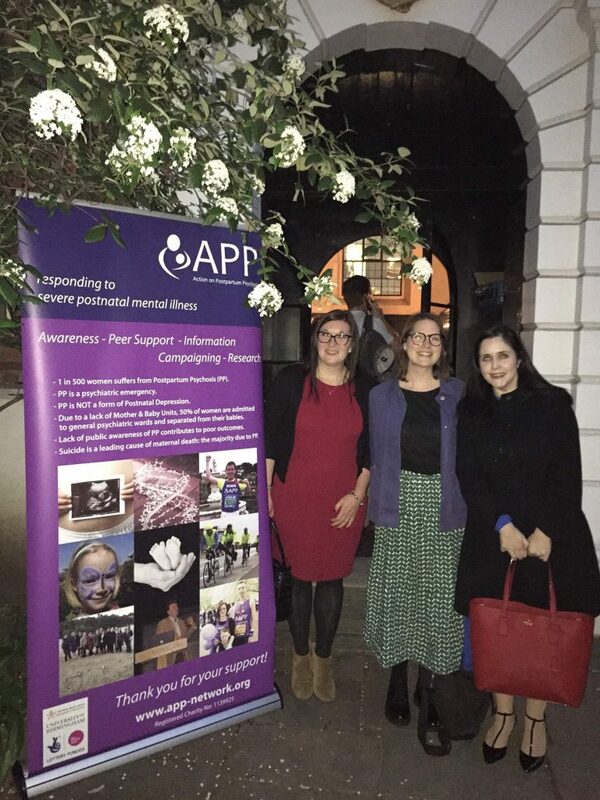 We were accepting donations to APP including at the bar which was busy all evening and we had many opportunities to talk to audience members about APP and the work we are doing to support women and families affected by PP. The opportunity to raise awareness of the devastating nature of PP and also what APP can offer, including our information and award-winning peer support, had also included an interview with Sophie as part of a piece on the ITN London news that evening, and a brief appearance by me about what PP was – a short sound-bite but important to have APP in there. Thanks to Sophie for sharing her story and also the brilliant venue of her employer’s roof garden with views of the city, which the film crew were very impressed by! The event had been organised in memory of a choir member, Amy, who sadly lost her life after suffering an episode of PP last year. It was clear how much she had meant to the singers as they performed rousing songs, which were interspersed with moments of comedy, dark humour and gritty readings by esteemed performers including Romola Garai and Alex Waldmann. BAFTA award-winning actress Imelda Staunton was breathtaking in her reading of Jessica Pidsley’s “Mutha Courage”, written about her experience of PP and featuring in a recent Radio 4 documentary (read more about it here). The audience were enthralled and moved by Imelda’s passionate account of Jessica’s experience. The evening ended with an emotional tribute by Amy’s husband Phil, who joined the choir in their last number. There was not a dry eye in the house as he spoke about losing his wife and the stigma which still surrounds psychosis. As we spoke to the audience and members of Amy’s family at the end of the performance, we all felt that the evening had been one we would remember for a very long time. PP Mums are amazing and the loss of anyone from this horrific yet treatable illness was something that was important to be part of. It was a privilege to be just a small part of this fantastic event." Network with other agencies and develop methods of engaging and supporting women with PP, particularly women experiencing multiple disadvantage. Translate our patient information guides into Welsh. Raise awareness of PP in the region, amongst health professionals and in the media. We hope that through this project we can build and support an active community of volunteers in the region to support women and families affected by PP and to work towards real change in how PP is understood and treated in the region. Alongside this grant, we will be looking for opportunities to train health professionals throughout Wales and campaign for change, including for a mother and baby unit. APP will be looking for two people to work with us (part-time) on this project, if you’d like to find out more about the project, or to be notified when we advertise the roles, please email us. Singing, celebration, spoken word and sisterhood! 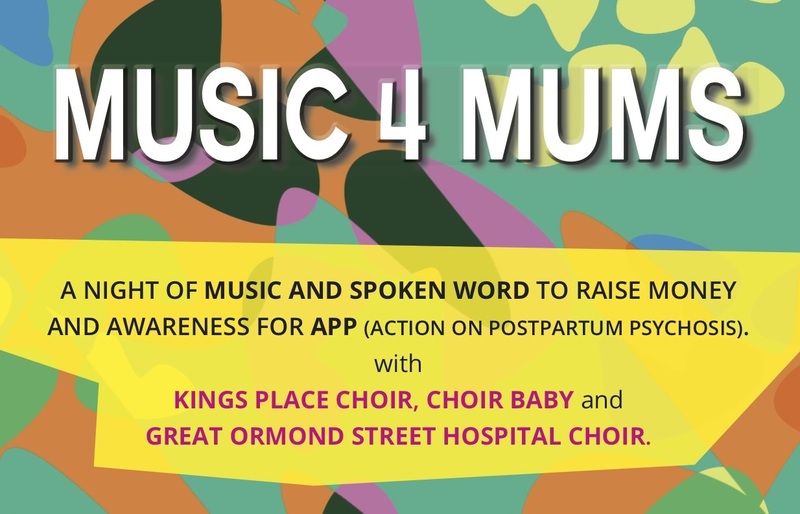 We are delighted to announce the first Music 4 Mums event for 2019! Taking place on Friday 29th March'Music 4 Mums' is an evening of singing, celebration, spoken word and sisterhood. 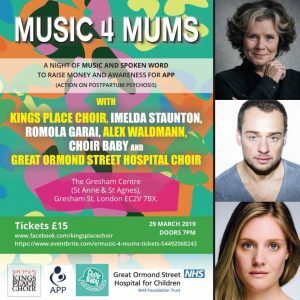 Featuring a stellar line up of female artists and special choral performances by Kings Place Choir, Great Ormond Street Staff and Parent Choir and Choir Baby, a choir for new Mums and Dads. 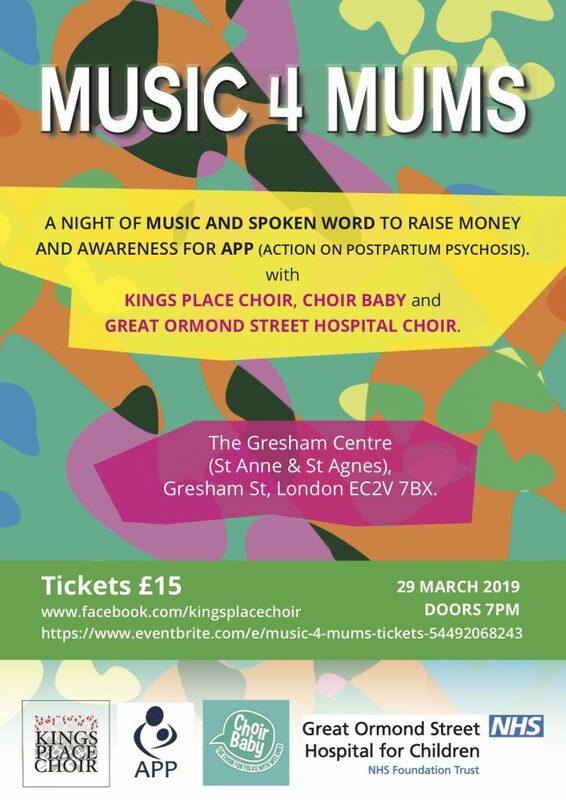 "This event will raise money for APP, and launch their ‘Music 4 Mums’ campaign for 2019. 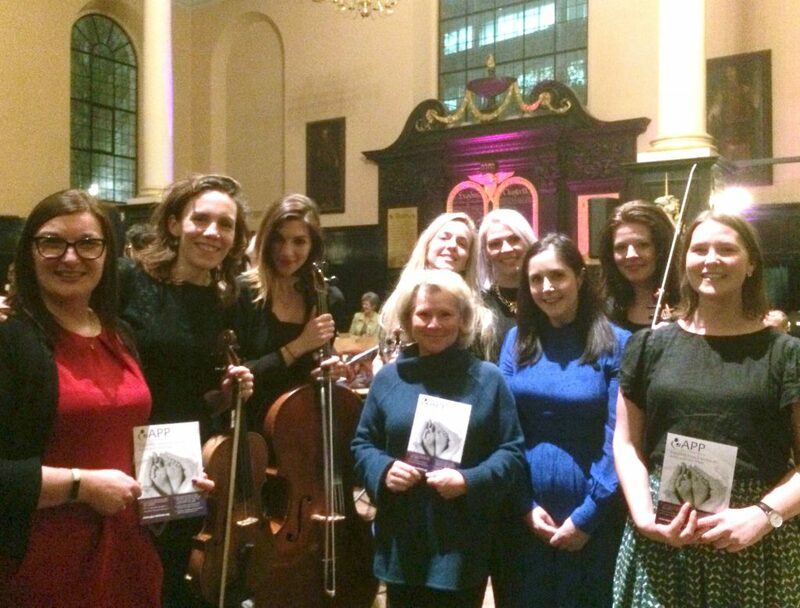 This campaign aims to celebrate mums with musical events all over the country, raising awareness of the need for adequate maternal mental health care services in every area of the UK, and raising much-needed funds to support APP’s vital work supporting women and families affected by postpartum psychosis....This event is an opportunity for people to come together in support of each other, lending their voices to the voiceless and helping to stamp out the dangerous stigma attached to motherhood and mental health, whilst raising funds for Action on Postpartum Psychosis. Please add your voice to this important conversation by coming along. Every scrap of awareness and funding will go towards helping a Mum get back on her feet so she can enjoy her new baby and hold onto the future she deserves." You can book tickets online via Eventbrite here £15 per ticket + booking fee, or find out more via the Facebook event page here. A very big thank you to everyone involved, we can't wait to come along and experience a fantastic night! APP at this year's Royal Parks Half! 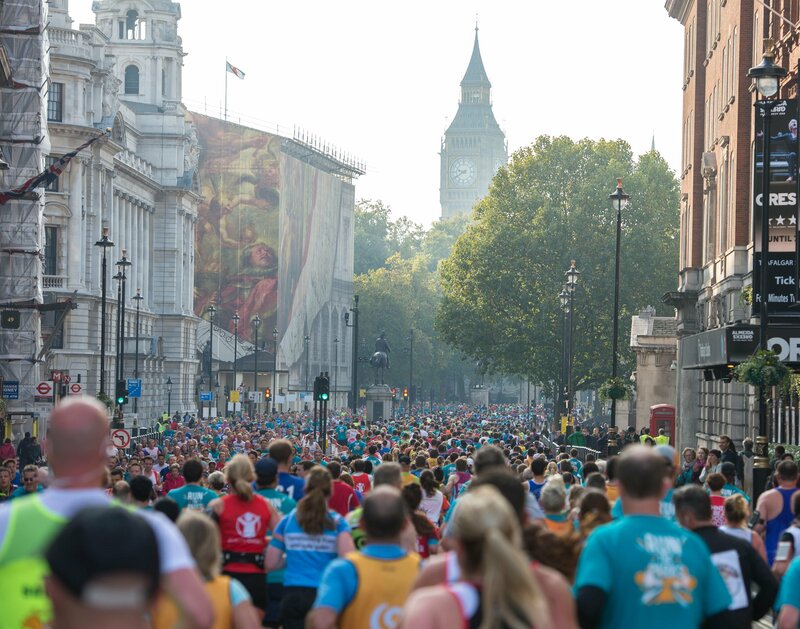 APP are looking for two enthusiastic runners to take part in this year's Royal Parks Half Marathon on 13th October 2019, could it be you?! The award-winning event was set up as an annual fundraising initiative, raising sustainable funds for the Royal Parks to support London’s eight Royal Parks, and enabling charities of all sizes to be involved in a major challenge event. If you would like to run the Royal Parks Half Marathon and raise some much needed funds for APP at the same time please get in touch with us via fundraising@app-network.org Thank You! 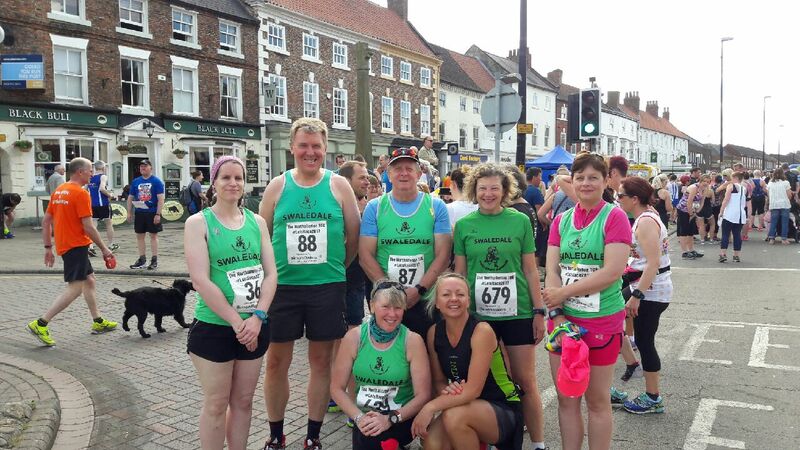 Helen's Northallerton Parkrun coffee morning! 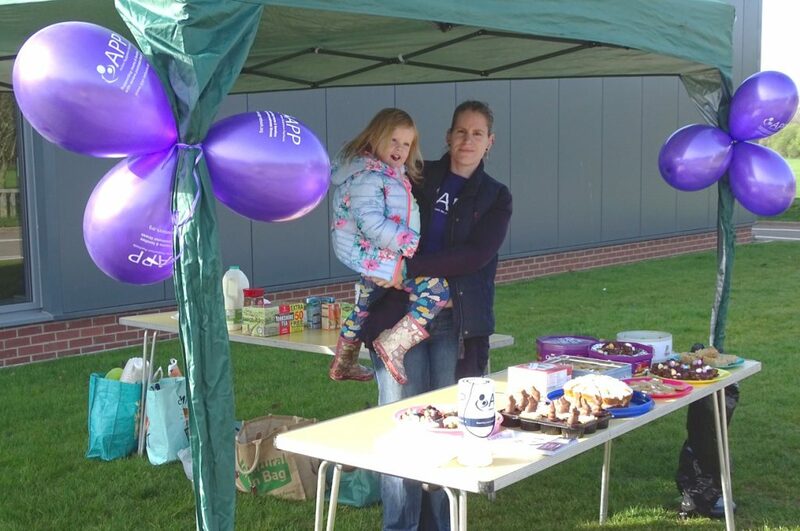 A big thank you to Helen, who is hosting hot drinks and cakes after the Northallerton Parkrun taking place on Easter Saturday, 20th April, in aid of APP! Please visit and donate to Helen's JustGiving page here, or turn up on the day for some lovely refreshments! Thank You to Some Voices! 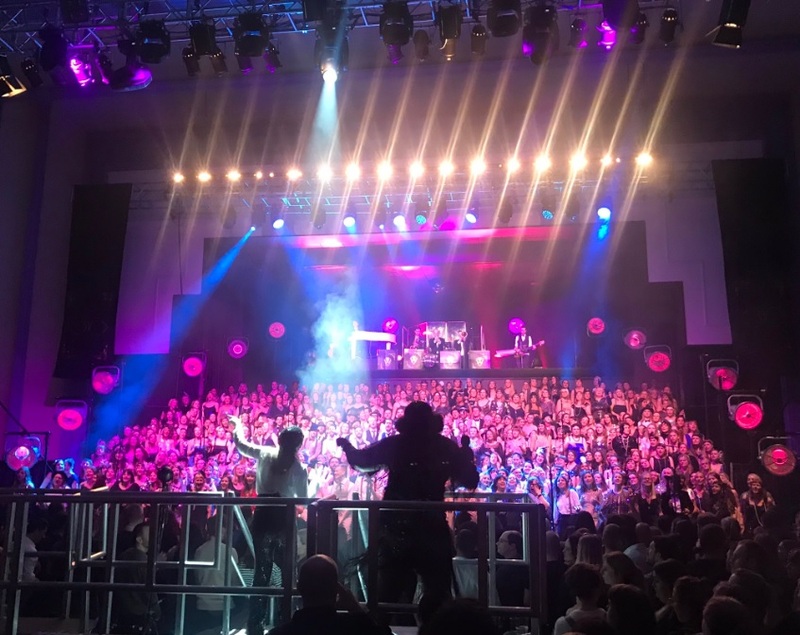 APP took part in three amazing and emotional nights at the Some Voices Speakeasy events at The Troxy, London on 10th, 11th and 12th December. 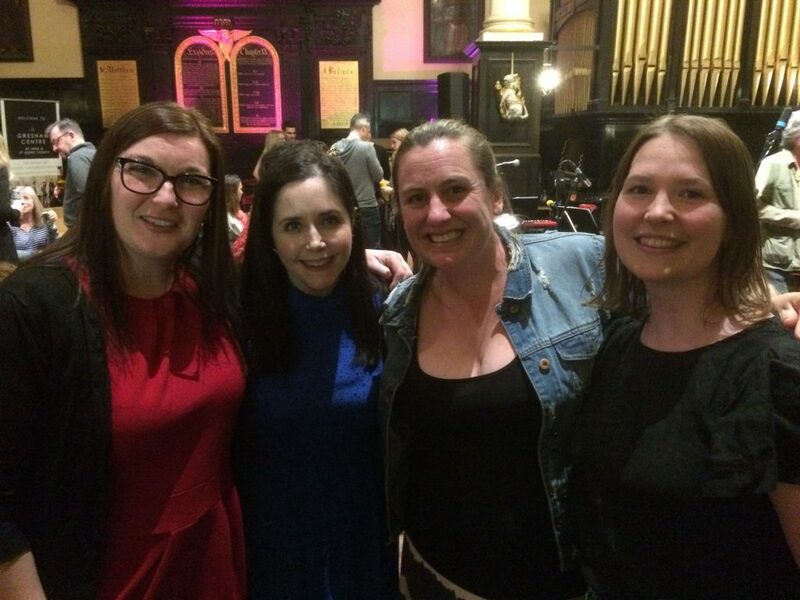 Some Voices were raising money in aid of APP in memory of a member of their choir who tragically lost her life to Postpartum Psychosis earlier this year.